Mariza Jonath is an artist born in Algiers. After a medical scientific career, Mariza Jonath decides to fulfill her passion : paint and sculpture. She starts self-taught by integrating the Ateliers Beaux Arts de of Paris. Since then, the work of the artist has developed to fill out towards the abstraction. The material and the paint take place in a symbolic dimension of the color. The creations of the artist represent an imaginary and a reality which have combined in a pictorial process of sharing and gift a different experience to the spectator. Mariza gives a materiality to her feelings and to her memories. 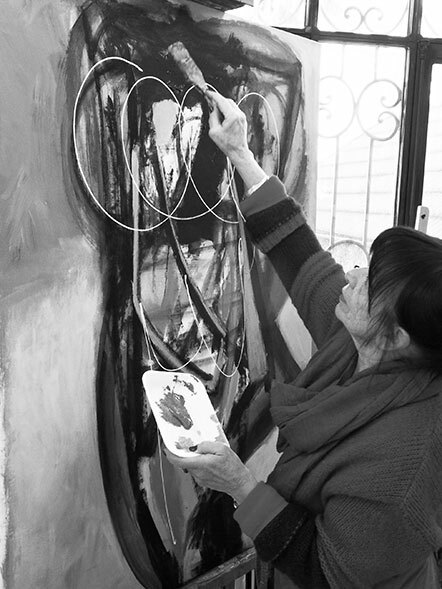 Through her works, the artist transposes the visual memories of her childhood and the lights of Mediterranean sun. Mariza Jonath uses a chromatic pallet symbolizing the nature to shape its art: the yellow of the saffron, the blue of the fresh leaves of the indigotier, the brown of the walnut and the pink of the root of madder for the transparency. Finally, she applies pigments as ochre, greens, blues and yellow to her canvas. Alongside to her paint, Mariza Jonath shapes the earth. Of this pure material, the artist creates the curvature, the sensualism and the generosity of the human nature by the work of the volume. The artist creates with Constantin Brancusi's words which guide her movement : " what really has a sense in the art, it is the enjoyment. You do not need to understand. What you see makes you happy? Everything is there. "